I don’t get down to Provo too often. 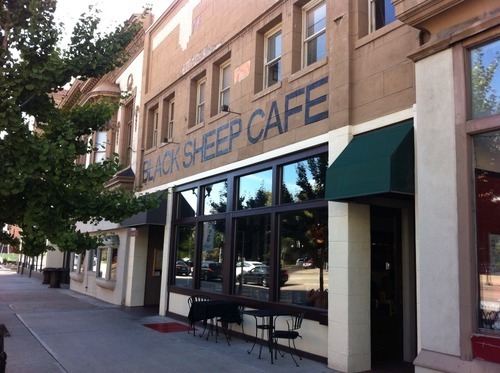 But I heard so many good things from my friend Becky about a new restaurant in downtown Provo called Black Sheep that I knew I had to make a trip. Black Sheep has an interesting background. 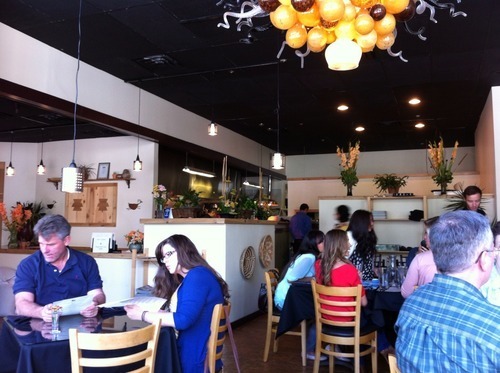 The restaurant is founded by two sisters, Bleu Adams and Jovanna Mason. They have their brother, Chef Mark Mason, as the executive chef of the restaurant. Their family grew up on a Navajo reservation, where they learned about cooking as young children. 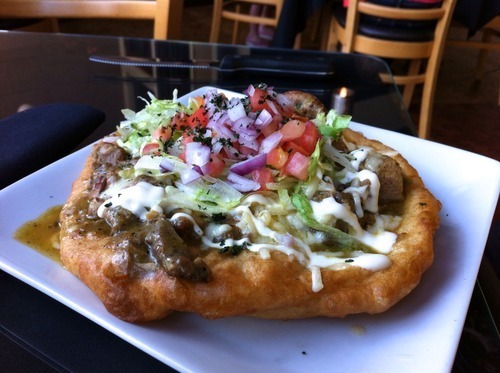 They have brought their Navajo culture and infused it throughout their new restaurant, Black Sheep. The restaurant itself isn’t over-the-top with decor or architecture. White walls, adorned with paintings from local artists, help brighten the spot up. I was intrigued with their floor, which appears to be plywood that was then lacquered over to make an intricate design in the middle of the space. Very cool. 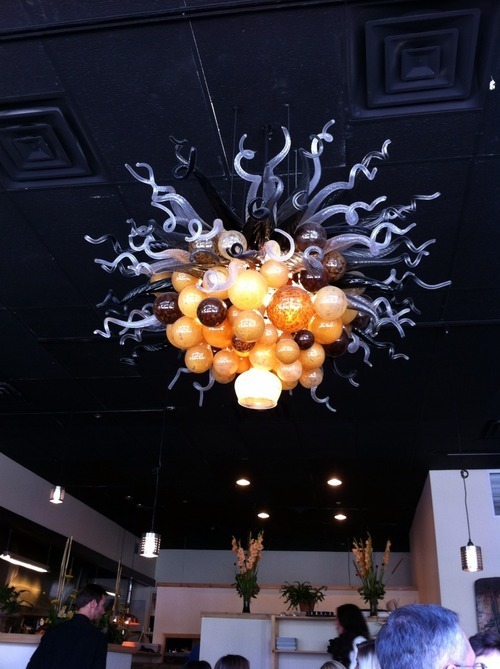 In the middle of the dining room, they have a beautiful glass sculpture hanging from the ceiling. Our server was very polite and knowledgeable about the menu. He let us know upfront that since they make everything from scratch and they only make things to order, that it can take a bit longer than normal to get our food. I can totally appreciate that. We placed our order, and that’s when service became a bit spotty. Water glasses and soda were left unfilled, and we felt a bit abandoned by our server. But not to worry, our food arrived soon enough, and it was absolutely delightful. The green chile Navajo taco was my favorite dish (I only wish I had been the one that ordered it, because I only had a few bites!). Wonderful flavors melded together to make it a fantastic dish. The pork was so tender it almost fell apart just by looking at it. 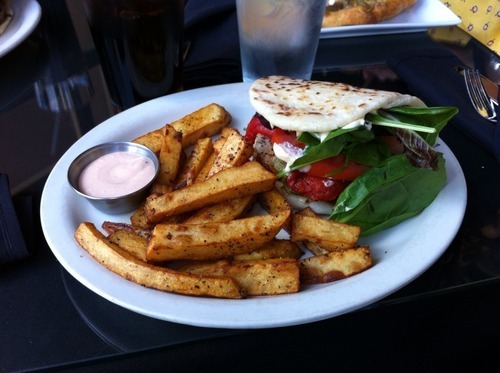 I had the pork chop sandwich, and it was a very good dish as well. It had just the right amount of spice, and the pork was cooked perfectly. I heard good things about the sweet potato fries, and was pleasantly surprised when I saw them on my plate. I was expecting skinny, fried, crispy little sticks. But I got much more than that. Black Sheep cuts their fries thick, and either pan-fries or bakes them (more likely a combination of both). Unlike thick cut potato fries, which tend to get dry and almost powdery in the middle, these sweet potato fries were moist and tender, and were served with a tasty fry sauce. Our buddy had the burger, and we heard good reports from him. He was kind enough to let me try the house-cured bacon, which is cut think and made from pork cheek. Yes. Service suffered at the end of our meal, just when a bridal shower at the table next to us began. Our checks were dropped off at our table, and we sat for a while waiting for our server to pick them back up, which he never did. We ended up tracking down a hostess at the front desk to run our cards. 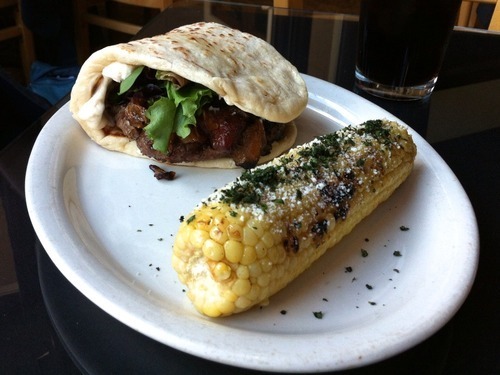 My favorite restaurants are those that take fairly basic dishes, and add their own special flair to them. It’s the little things, like the beautiful salsa served atop the Navajo taco, that separate the ho-hum from the next level. Black Sheep is certainly taking things to the next level, and I can’t wait to see how far they go.